SDNYC Annual Event Update & Reminder! We hope to see you this Thursday, June 1st at our annual event! See our annual event page and facebook for more info! SDNYC Statement on Bronx Democratic Party & Electeds Supporting Ruben Diaz, Sr.
SDNYC's 2017 Annual Event Honorees! Please purchase tickets / sponsor our event at www.SDNYC.org/2017 & we hope to see you on June 1st! This afternoon, the five Republican members of the Senate Investigations and Government Operations Committee, along with Democratic committee member Ruben Diaz, Sr., voted against the Gender Expression Non Discrimination Act (GENDA). The final tally was 6-3. Since the bill was written in December 2002, GENDA has passed the Assembly 10 times. However it has never passed out of Senate committee. Stonewall Democratic Club of NYC (SDNYC) is grateful to the leadership of Senator Daniel Squadron and the support of Senate Minority Leader Andrea Stewart Cousins, Senator Brad Hoylman, and the entire Democratic Senate team on the continuing efforts to advance GENDA. SDNYC is deeply disappointed that transgender New Yorkers were once again denied equal rights and we join, with transgender people in New York and around the nation, in looking wistfully at the GENDA bill and a near 20 year record of lost opportunities and bad faith bargaining. SDNYC recommits working to support public officials that believe, like the vast majority of New Yorkers, that everyone in our state deserves equal civil rights and we implore the Democrats in the New York State Senate to come together, reform as a Senate majority, and pass GENDA. 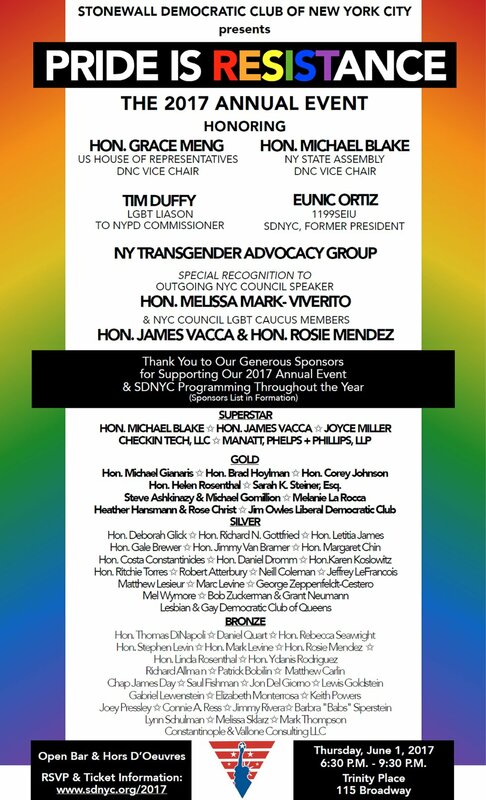 Stonewall Democratic Club of New York City (SDNYC) is proud to be a cosponsor of this important forum with Melissa Mark-Viverito, Rosie Mendez, Corey Johnson, and the New York City Council LGBT Caucus. We strongly urge our members to attend!